The H55’s Top Speed Makes for a Thrilling Ride. The H55 builds on Hunton’s impressive heritage of offshore racing and arrives both in style and ahead of the pack. Equipped with twin Man V8-100 engines, the yacht is a thrilling ride, not just for her performance, reaching an eye watering top speed of 55 knots but also her superior stability. Every Hunton Yachts design has evolved from a heritage of racing and continually pushing the envelope of luxury and performance. The H55 is the next step in this process with her size, combined with exceptional performance, stability, innovative layout, and liveaboard features which put her in a new luxury cruising class of her own. But its Speed Doesn’t Compromise its Stability. The advanced geometry of the H55’s hull design is certainly a core stand out feature of this yacht. Designed for superior stability, driveability and sea-handling, her Deep-V entry, low vertical centre of gravity, hard chines and lifting strakes deliver the “world-famous smoothness Hunton is known for,” according to Hunton. The design is optimized by her epoxy composite construction utilizing E-glass, engineered foam core, and the vacuum bag resin infusion process for a stronger more durable yacht. The Yacht Boasts Hunton’s Quintessential British Design. 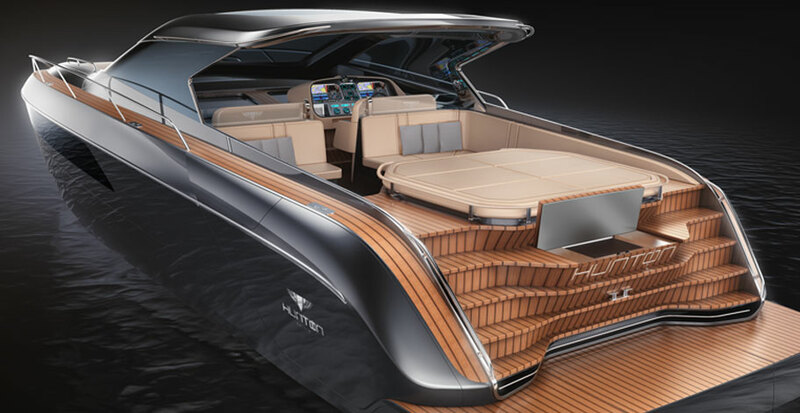 Hunton has drawn on its British heritage to produce a yacht that is “as refined and unfussy as a Savile Row suit” and as “sleek and powerful as a classic British motorcar” with “gentlemanly swagger” by the bucket load. While Hunton admits it has “not always been known for its interiors and aesthetic”, the H55 is set to change things. Belowdecks is a spacious en-suit master, large windows for plenty of natural light and a fully enclosed shower. To starboard is a guest/day head and the forepeak sleeps two port and starboard, or converts to create a queen birth, ideal for cruising with the kids or another couple. With its revolutionary hull design, Hunton is confident the H55 will transcend the global market. While singling out the Asian and North American markets as ripe territory for the H55, the company said the yacht has universal appeal. Equipped with fly-by-wire digital throttles and joystick control, class leading close quarters maneuverability, she is ideal for owner operators with no need for a captain if so desired. Her innovative and feature reach cockpit is an inviting entertaining space for friends, or for a private breakfast or dinner for two. With an expansive swim deck with folding platform, king size sun lounger and relaxing salon, she creates a successful marriage of the comforts and capabilities of a large motoryacht, with the fun, performance, and features of a luxury day yacht. There are a Number of Customisation Options. The H55 comes with a number of customisation options ensuring an owner can make it entirely their own. They can either opt for the panoramic hardtop with tinted class or for an electric fold away bimini. Additionally, the H55 comes with an optional Seakart 285 custom tender which stows in a garage allowing ultimate flexibility. Send us your question. We look forward to building your Hunton.